In Spotify, when you’re playing a song, its album cover art shows up at the bottom-left of the window (click it to make the artwork even larger). A cool trick in Spotify to display the cover art for all songs in a playlist or folder — which was a hidden shortcut for ages and not officially supported until recently — is to choose View→View as Album List. Alternatively, Ctrl+G (Command+G on the Mac) works, too. Why would you live with such an uninspiring-looking playlist when you can have pretty pictures complementing it? 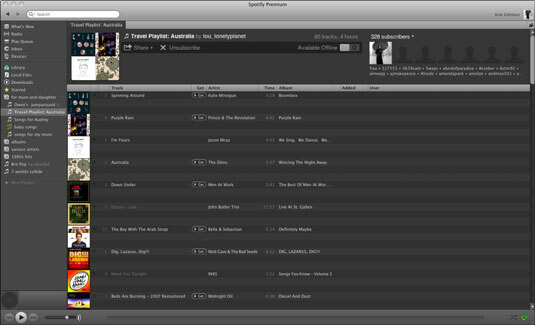 Following is the same playlist after the effect is applied. To go back to the original dull view, press Ctrl+G again. You also can show album cover art in this way when you’re viewing local files and your Library. You can resize the albums and make them even bigger. Move your mouse cursor to the gray bar at the top of the listings and hover it over the line that divides the cover art column from the Track column. The cursor turns into a line with two arrows coming out of it. Click and drag the edge of the cover art column to the right and watch that column magically expand. 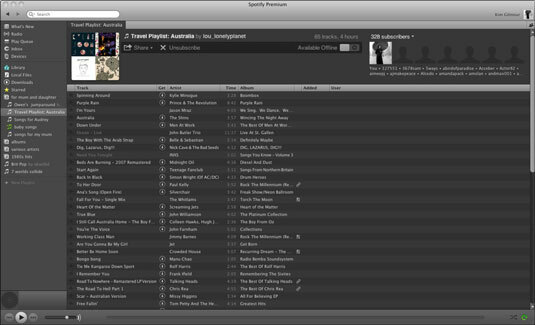 Spotify remembers your column size preferences, so if you quit the program and come back, you don’t need to resize them.